Canopies can be created on either a Gondola Island aisle or a Wall aisle using a standard upper shelf directly mounting a wooden type canopy that is actually 2 pieces of wood firmly mounted together with two types of canopy ends available. 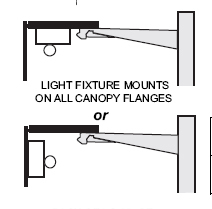 Lights can be mounted in either two different locations as shown on the image on the right. 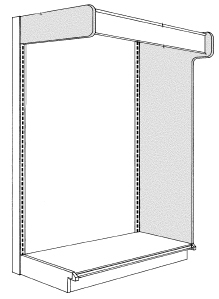 Two type of canopy ends are available for both Gondola Island aisles and Wall Aisles as shown on the image to the right. One canopy is just a small canopy end that would just simply cover the shelf the wooden canopy is mounted to and the end of the wooden canopy section. 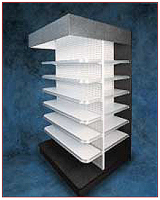 The second canopy end can cover the entire end of the shelving section. 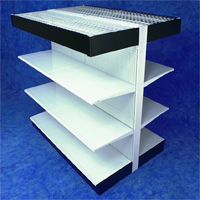 The wooden canopy face that simply mounts to a upper shelf with sheet metal screws is available in either four foot or eight foot sections for $99 each. For laminate add $100 per pattern per orderAll wood construction in either standard or specified laminate finish. Three inch bottom return conceals light tube and fixture, precision doweling plus screws drive connectors insure light tight joints.